At a time when many of the organisations of the State including students’ organisation All Assam Students’ Union (AASU) continue to raise voice in various burning issues of the State, the principal of Margherita College, Dr Buddhin Gogoi on Wednesday stated Assam is lagging behind compared to other States of the country due to involvement of around 27 lakh unemployed youths in protests and demonstrations. It may be mentioned that most of the organisations and political parties continue to stage protests in various parts of the State against the Citizenship (Amendment) Bill, 2016. 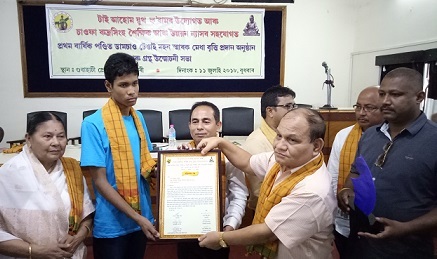 Later, in the programme organised by the Tai Ahom Youth Forum in association with the Chaopha Rudrasingha Saikshik and Unnayan Nyash, Gunajanan Barua, who secured 8thrank in the HSLC 2018 examination, was felicitated with a citation, a Pha-Sit and a memento. Gunajanan Barua was a student of Dopani High School at Demow in Sivasagar district. Dr Baleen Kumar Konwar, former Vice-Chancellor of Nagaland University was present as the Chief Guest at the programme. Debabrat Sarma, principal of Jorhat College, was also present at the programme.